Are you one of those who thought that strength training or weight training are solely designed for those who go to the gym? 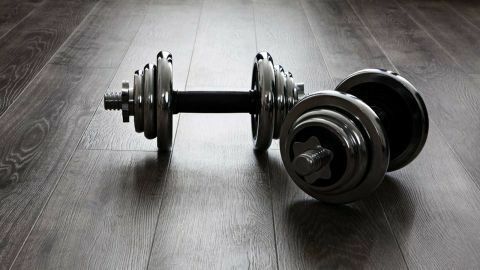 Did you think that using weights at home is simply impossible? Well, let us bust these myths! Strength training is a very versatile form of working out and can be done at home without a wide range of equipment. All you will need are dumbbells and kettlebells. Some people might also invest in resistance bands and if you choose to do the same, you will not be disappointed. We will give you a workout routine that uses dumbbells and kettlebells. Feel free to customise the workout according to your convenience. What we would like to point out is that no matter what your workout routine is, warming up and cooling down are extremely crucial. They prevent injuries and fatigue. Further, breathing pattern, form, posture, reps and sets, all of these are equally important. Lastly, do not let your comfort zone limit you. Try and move past your boundaries optimally, that is, without getting overboard with it. You will see drastic changes if you learn how to shock your muscles every now and then. Also, diet is very important and staying hydrated helps you stay energised before, during and after the session. Step 1: Stand with your feet about hip-width apart. Hold a dumbbell in each hand and keep your arms by your side. Your palms must face forward. Step 2: Without bending your elbows, raise both your arms sideways. Your palms will face forward throughout the set. Go until you feel a pull. Step 3: Lower the dumbbells back down to the initial position and repeat.